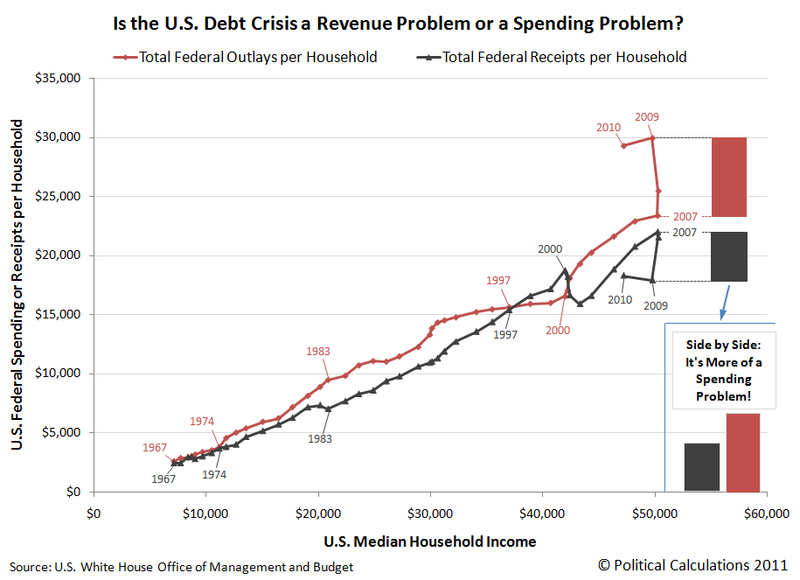 U.S. Debt Dilemma: Caused by Excessive Spending or Not Enough Revenue? Assuming that the current U.S. debt crisis began in 2008, which is more responsible for the current U.S. government debt crisis: excessive government spending or too big a fall in government tax receipts? At its peak in 2009, we find that the gap between the federal government’s spending and its tax collections is much more heavily weighted toward the side of excessive spending. With spending accounting for approximately 62% of the pre-crisis gap, we find that excessive spending by the U.S. federal government in the years since 2007 is primarily responsible for the current debt crisis. But that may be a moot issue. The key point to understand in the current debate is that while the federal government is not capable of precisely controlling the amount of its tax receipts from year to year, it is more than fully capable of controlling the amount of its spending. But only if there are enough people elected to the government who make that objective a priority!